1. Time & Patience Op-shopping is not for the time-poor. I like to flick through every garment on the rack because otherwise how will I know if I’m missing a bargain?! The longest I’ve spent inside a Savers (huge second-hand department) store is probably 2 to 2.5 hours. Yeah. Full on. So obviously patience is also hugely important. 2. Find a balance between talking yourself out of every purchase because it’s not 10000% perfect (common amongst novice op-shoppers) and buying everything you pick-up because it’s cheap (i’m majorly guilty of this- black & gold sequin studded belly-dancer costume, i’m looking at you). Remember the equation; Cheap + Cheap + Cheap + Cheap + Cheap = Expensive. But while none of us have endless closet space and cash, it’s worth hanging on to pieces that; fit you perfectly, are in mint condition and are 100% silk, leather, cotton or fur. But if you can’t imagine them in an outfit comprised (mostly) of clothes you already have, chuck it. 3. TRY IT ON When clothes are dirt cheap it’s easy to buy them without trying them on, thinking “Oh well! At $3.99 who cares if it fits or not?!”. However this often results in piles of ill-fitting clothes in frustrating places, like your bedroom floor (also remember The Equation!). Said clothes then need to be bagged, transported to the car, driven to a charity store or bin, transported from the car to the bin, lifted into… well you catch my drift. Clothes end up back where you paid your hard-earned cash for them in the first place. A pointless exercise. 4. Frequency Great op-shoppers visit their local charity shops often (how I love a sweeping generalisation!). But really, going often means you become more discerning at spotting the gems from the crap; much like people who frequently work-out at gyms get more fit (I’m assuming, I don’t actually work-out at gyms), people who go op-shopping often get more op-shop savvy. I also believe that the more you go, the more the universe will provide for you. This makes absolutely no sense. But it’s true. 5. Comfort Don’t be; hungry, tired, pre-menstrual, emotional or thirsty. You need maximum clarity to op-shop well. Don’t be carrying a massive handbag or sunglasses in your hand, as you need both paws for rummaging efficiency. Also I find op-shopping much like playing hide and seek, as soon as you get stuck-in you will need to pee. So always pee beforehand, even if you think you don’t need to. 6. Partners Choose your op-shopping partner wisely. I strongly discourage op-shopping with someone who has exactly the same taste and is exactly the same size as you, otherwise: cue arguments and clothes tug of war. Also, I can’t stand op-shopping with someone who has zero vision i.e. they can’t use their imagination to see how amazing something is going to look and thus poo-poo everything you try on. Talk about kill-joy. It also helps to have some who can be completely honest about whether that floral onesie really suits you or not. Finally, avoid taking that person who interrupts your op-shop chi every 5 minutes to show you something ‘hilarious’. Yes shoulder pads were big in the 80’s, time to move on. 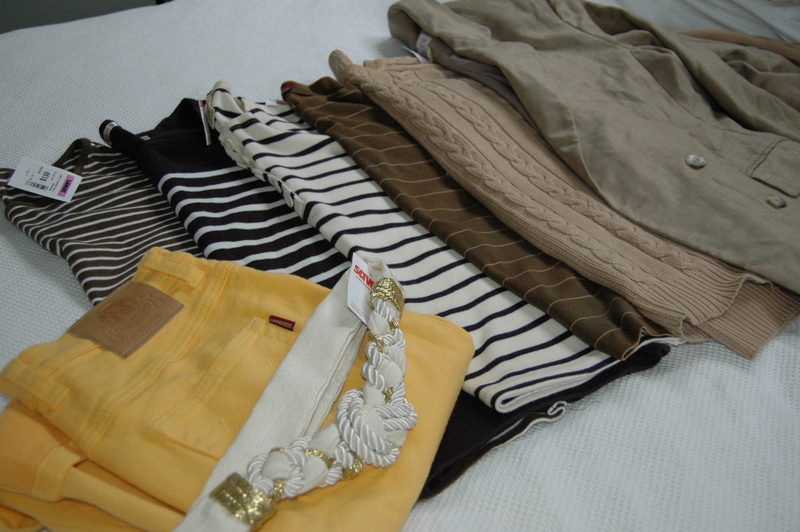 Yellow Jeans $7.99, Belt $2.99, Green & Cream Striped Basic $1.99, Navy & Cream $2.99, Cream & Navy $9.99 (bit if a rip-off because it’s ‘L.L.Bean’), Green & Yellow $2.99, Brown Cable-Knit Sweater $8.99, Neutral Linen Blazer $7.99. This entry was posted in Fashion, Misc and tagged Charity Shop, Fashion, How-To Guide, New Purchase, Op Shop, Savers, Thrift Store, Vintage. Bookmark the permalink. 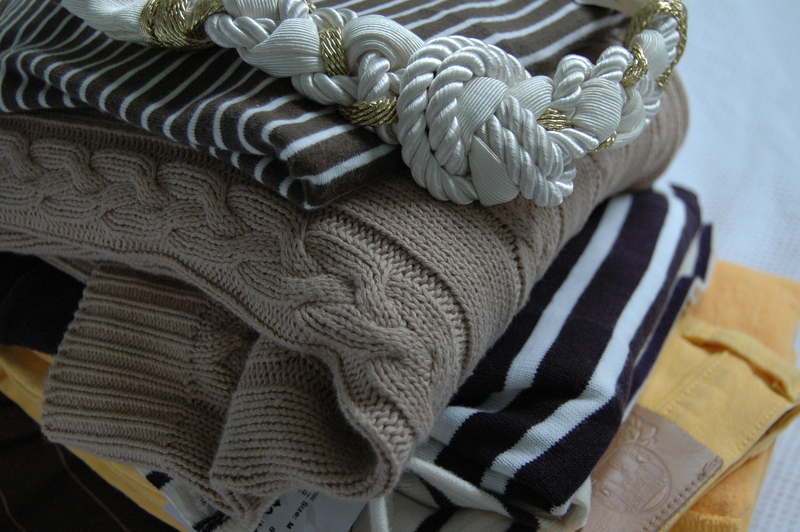 7 Responses to Secrets to Op-Shopping Success! I NEED to get to Savers. I hear such awesome things about it. don’t go with novices, full stop. They will tire too quickly and make you feel guilty for taking a long time, they will ask you to “help them find things” and they will waste precious rummaging time by pulling out “funny” things to show you every two seconds. Also, a tip that makes me sound like way less of a jerk, is to completely ignore sizes when you’re looking at dresses in particular, because a) vintage sizes are different blah blah and b) there is not much you can’t fix with a belt. I have several size 14 dresses. Also don’t go in with expectations about what you want to buy, and don’t buy old shoes with foam soles (they crumble weirdly. It has happened to me twice).